To avoid teacher burnout, all teachers need THIS Pep Talk! Disclaimer: This post contains affiliate links. See disclosure policy. 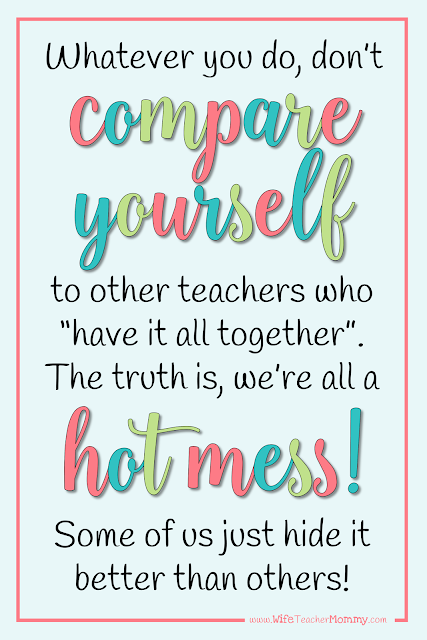 I think most teachers feel like they are a “hot mess”. I know I did. So of course you’re feeling overwhelmed. And you may be tired and exhausted… like, ALL the time. You may feel like you CAN NOT do it all. But you know what? 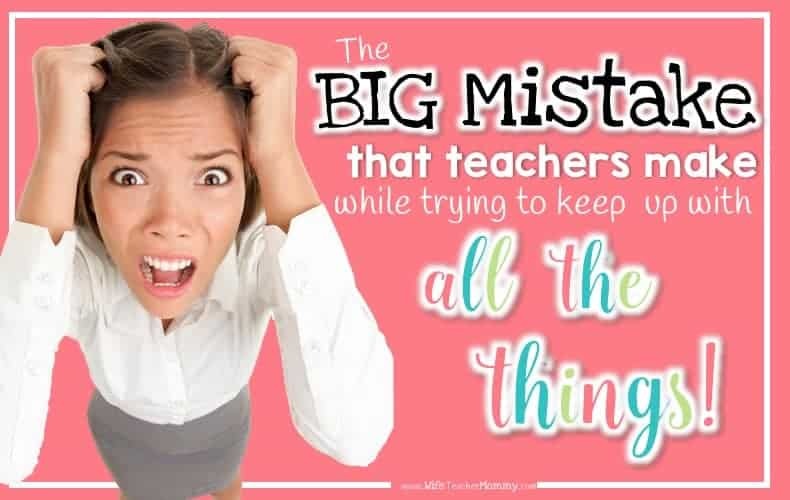 That is NOT the biggest mistake teachers make. It always leaves you wondering- how does she do it all?! And why do I seem to be such a hot mess compared to her? Now I don’t say this to be “braggy” or anything, because if you know me at all you know that I am NOT that type of person. I’m telling you this just because this alone shows that many teachers relate to this. Most of us ARE guilty of comparing ourselves to other teachers. We see another teacher who seems like they are always on top of things. Their room is organized, their students are well behaved, they even seem to have everything together both at school AND outside of school. However, it’s important to remember that you are only seeing things through your perspective. They have struggles that you don’t know about. Someone else at your school is probably looking at YOU and saying the exact same thing, because they don’t know your struggles. When you’re comparing yourself to others, it causes you to focus on the negative things about yourself and the positive things about the person you are comparing yourself to. This is damaging, and it is a BIG mistake! With that said, try this. 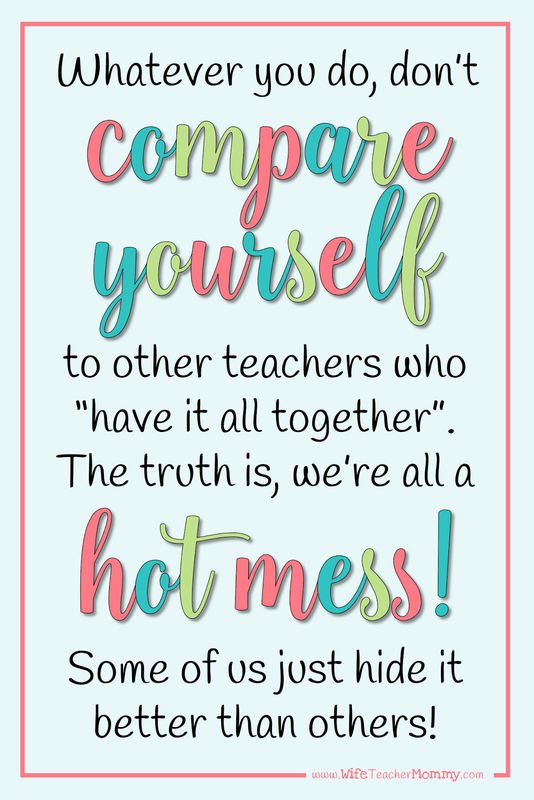 Try NOT to compare yourself to other teachers this week. Focus on YOU. Focus on what YOU are doing well, rather than putting yourself down with all the things you can’t get done. We have so many things on our to do list that it is impossible to get it all done. Remember you are one person, and you can not do everything. 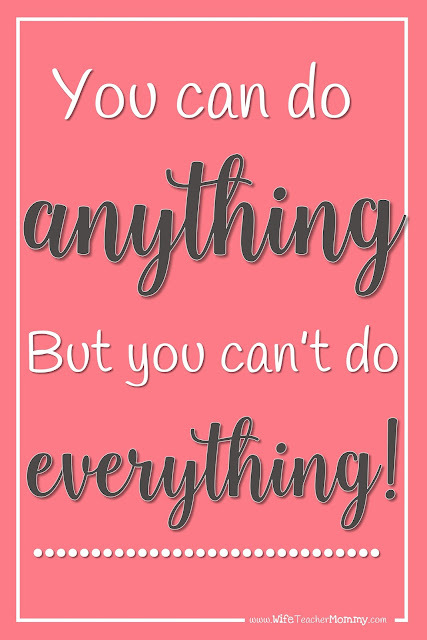 A quote I once heard and loved was: YOU CAN DO ANYTHING, BUT YOU CAN’T DO EVERYTHING. You literally can’t do everything. Neither can that teacher next door. You may think she is doing it all, but she’s not. She may be thinking the same thing about you. Prioritize your life, do what’s most important, and then let everything else go. Take a deep breath. Eat some chocolate or Ben and Jerry’s if you have to! It’s okay if you leave school before everything is done. It’s okay to have other priorities outside of school that come FIRST, especially if that is your family. Yes, we want to do everything we can for our students, but not at the expense of our own health or our families. And certainly not to keep up with the teacher down the hall. So when you find yourself comparing yourself to another teacher, just say NO. Stop it! Because remember, they’re a hot mess just like you. WANT A FREE PRINTABLE POSTER WITH THIS QUOTE, FREE SUB PLANS & MORE? 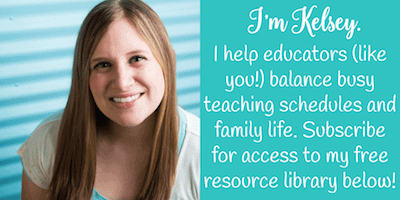 You’ll get exclusive access to my resource library when you sign up below! 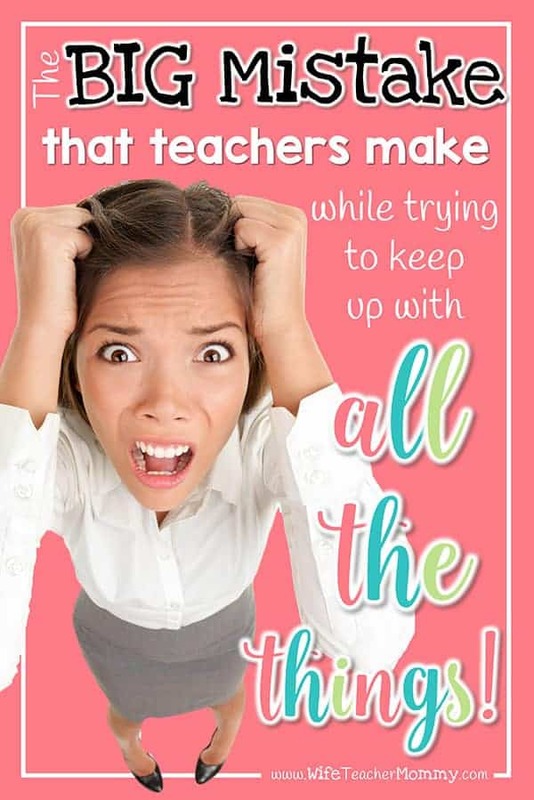 I know how stressful it is to be a teacher (as discussed in this post) and I know how stressful it is to plan for a sub. In addition to the freebies, I’ll also send you some additional information to help you get your sub plans ready so you don’t have to stress about it anymore. You’ll also be subscribed to receive teaching tips, inspirational and funny teaching quotes, as well as blog and resource updates! Click on the image below to grab your freebie and get in on the fun! 20+ years and I still feel like a hot mess! Thank God I really do love this job despite the craziness. Comparison is the thief of joy!